Physical descrip: 1 digital image - col. Accompanying note: "The non-partisan budget analysis organization made annual reports on what it considered 'turkeys' in the budget -- items that have little or no statewide impact, or which were placed in the budget as favors to powerful House and Senate members, like holiday turkeys given to favored employees of a business. 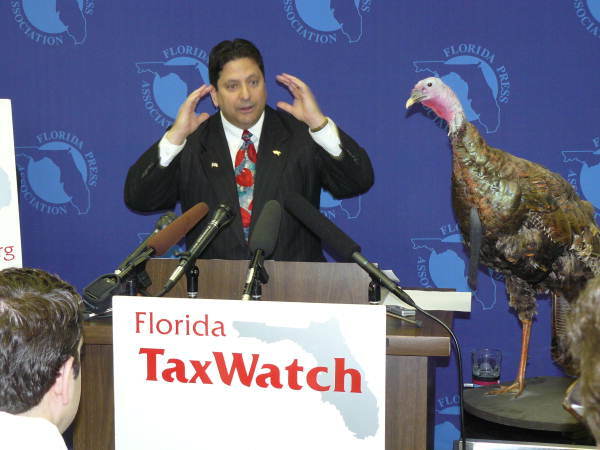 Calabro brought a stuffed bird to his news conference every year as a prop."